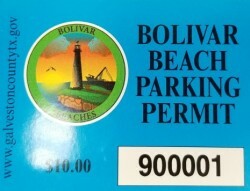 Most stores and real estate agencies on Bolivar sell the beach sticker, as well as the Chamber of Commerce, 1750 Hwy 87 in Crystal Beach. *Indicate the type and quantities of stickers needed: ATV/golf cart/motorcycle or a vehicle sticker. 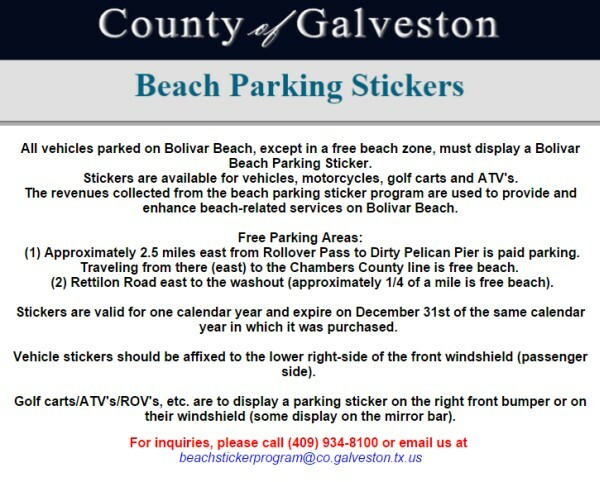 *Please make checks payable to: Galveston County Parks Department. Visit the Parks & Cultural Services Administration Office, Monday-Friday from 8am-5pm. The office is located at Carbide Park, 4102 Main Street (FM-519), La Marque, TX 77568 inside the Wayne Johnson Community Center. Cash, check or money orders accepted. We'll answer all your inquiries about Crystal Beach and Bolivar Peninsula.